Meet Chris Darway and Learn the Aura 22 Technique: Master Jeweler Holds Class at the Gem Cutters’ Guild, Baltimore, September 8th. Date: Saturday September 8th, 9:00 am to 5:00 pm. Aura 22 was developed to be used on fine silver metal clay as an alternative/supplement to Keum-Bo. This new method allows us to apply Aura 22 to not only fine silver but sterling and copper. Instead of a kiln we’ll use a torch. Once fired the material can be rolled, fold formed, soldered on, drilled and etched. Aura 22 fired pieces are perfect for enameling. Join us for this one day introduction to Aura 22 Gold. Materials cost is included with tuition. 1) One gram package of Aura 22, a liquid gold material, which is 91.6% pure gold and 8.4% fine silver. This precious metal is able to fuse to silver, copper and brass at low temperatures, creating in a layer of gold considerably thicker than that achieved by electroplating. The result is a deep golden color that is hard wearing. The name of the Gem Cutter’s Guild is a bit of a misnomer. While many of the members are interested in lapidary–the cutting of stones–this is not the single focus of the group. Jewelry making is a prime interest and the Guild offers classes in jewelry fabrication as well as the lapidary arts. Classes are scheduled year round. As Wikipedia states, A lapidary (lapidarist, Latin: lapidarius) is an artist or artisan who forms stone, minerals, or gemstones into decorative items such as cabochons, engraved gems, including cameos, and faceted designs. The primary techniques employed are cutting, grinding, and polishing. After cutting stones in the Guild shop, members can incorporate their cabochons in a finished piece of jewelry. 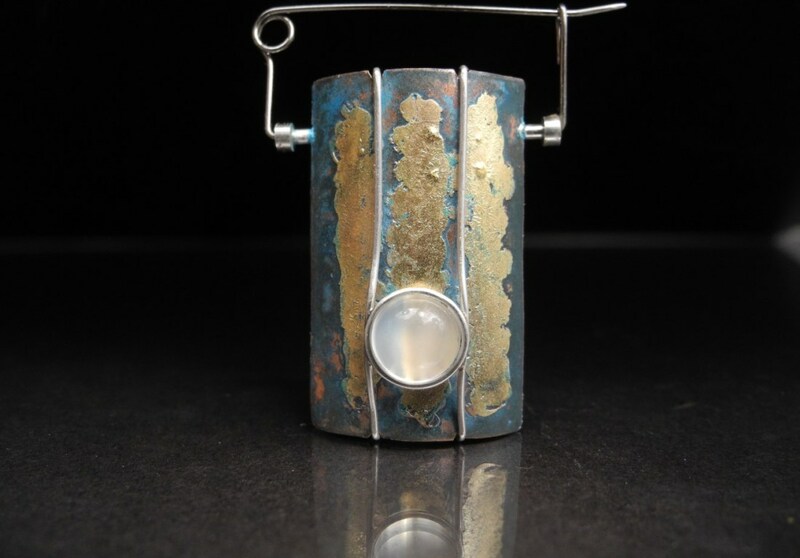 The jewelry classes include metalworking and fabrication, courses in patina, fold forming, wire wrapping, soldering, bezel making, torch fired enamel and Precious Metal Clay, and more. Metals used in class include sterling silver, fine silver, copper and brass. The Guild studio is a well equipped space that offers the student the opportunity to learn the techniques of jewelry fabrication, using the tools that one might not have in a home studio. There is a line of Foredom Flexshafts, saws, grinders, soldering stations, kilns, work tables and much more. All of the tools are available for student use, and the shop keepers make certain that the tools are in good working order. This year (2018) the Gem Cutters Guild will offer a series of classes that are available for very, very reasonable prices. Tuition is kept as low as possible, keeping in mind that the Guild is a non profit organization, which is interested in spreading knowledge about gem cutting and jewelry making. Some of the classes being offered this spring include Basic Lapidary, wire wrapped stones, torch fired enamel and more.